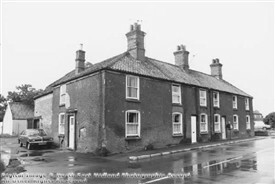 Numbers 1,2,3, and 4 Main Street, Aslockton, were once maltings. After conversion to dwellings, No.1 became a butcher's shop, the section beside the car being used as the slaughterhouse. It then became a garage for the house. This page was added by Website Administrator on 13/09/2013.